Note: No elevation chart today because we were still on the Barnaby Alt until lunch and there isn’t an elevation chart for that alternate. This post is picture heavy. Just have to share it all! Last night we cowboy camped. A big reason why I don’t like to cowboy camp is all the little creatures running around. Last night, I was awoken to a clanking sound at 12:30am. When I flipped on my headlamp, some little rodent of some kind ran off. It woke up E and we both tried to fall back asleep. Then the noise again and we thought it was just the noise of whatever it was running over the small rocks. Then a more definite sound and I turned on my headlamp. A squirrel was trying to run off with my hiking pole! He drug it a few feet and tried again. It must have been the salt on the handles. I shoved the poles in my pack along with anything else laying around. 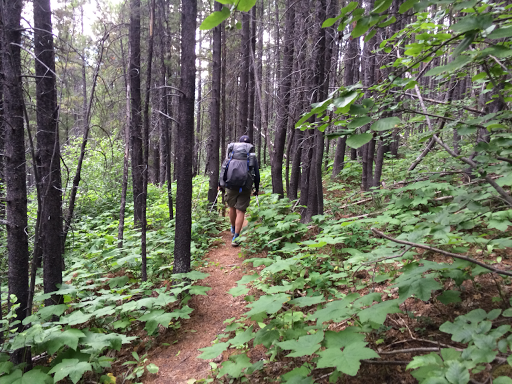 Through to 3:30am, he kept returning every so often and messing with things around me until I zipped my pack and all my belongings into my tent, which I was using as a groundsheet, and covered it in rocks. It drove both of us nuts and we got little uninterrupted sleep. We did however marvel at the stars and Milky Way just above us around 2:30am. Today I found out that it gnawed little bits off my hiking pole handles and the handle on my umbrella, ugh! I don’t know why people like cowboying so much. We both were happy to embrace the moment, but agreed that it might not happen again this trip, ha! 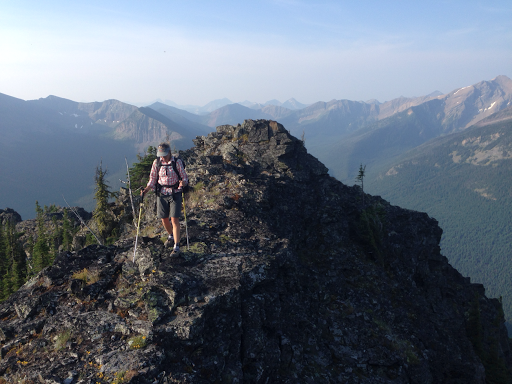 Despite the lack of sleep, we still got going at 6:30am because we still had 7mi/11.3km left to do of Baraby Ridge and we heard it would be slow going in spots…actually, the words used were “harrowing,” “gnarly,” and “daunting.” First up, was a long ascent up a ridge with an extended narrow spine near the top. There was definitely some exposed scrambling involved and we had to pass packs a couple of times. It was reminiscent of some of the Hayduke stuff where it wasn’t death defying, but you definitely needed to watch your step to not break a leg. 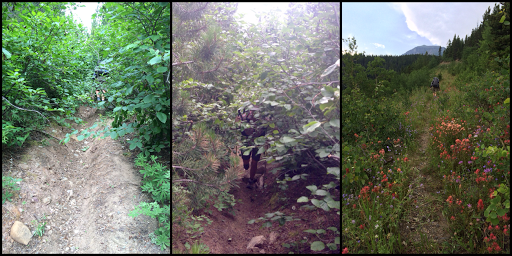 Here’s photos from that narrow highpoint. 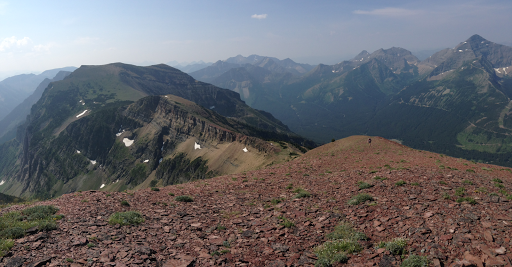 An awesome photo with a view looking back on the rest of Barnaby that we hiked along. With all the scrambling, took us two hours to get over that peak from where we started. We had plenty of time buffered into our schedule and we were able to do it at a relaxed pace. After that first hurdle, we stopped for our daily breakfast break. E likes to have a sit down breakfast each morning a couple hours into the day. It’s been nice to take that time each day and I actually look forward to it. 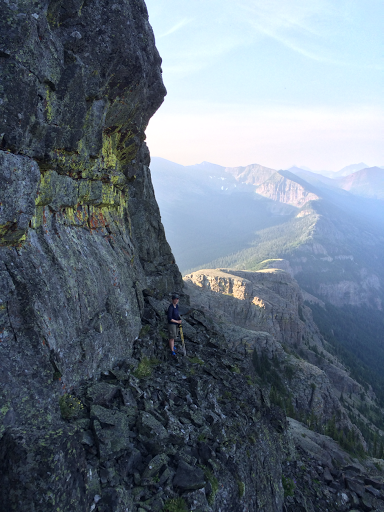 Today, I got phone service and was able to post 2 of the 3 blogs from this leg thus far. After our break, we next had peak 2471 to get over as we continued on Barnaby Ridge. It is the darker color peak on the right. The climb looked to be a draining one, but it went by surprisingly fast and we found them to be just the right amount of challenge. 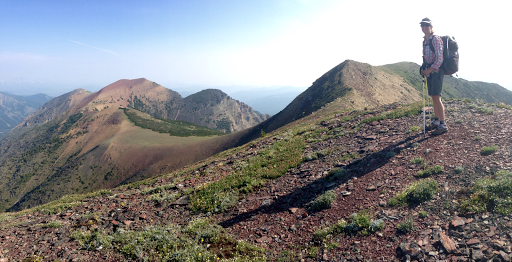 The views all morning along the ridge were grand despite the haze due to fires in the somewhat near distance. Once up on top of 2471, we were looking directly down on Castle Mtn Ski Resort. If we had taken the guidebook route rather than this Barnaby Ridge alternate, we’d be walking that road and go right by the resort and hostel there. We agree, this was totally worth the extra effort. The last big hurdle was South Fork Mountain. 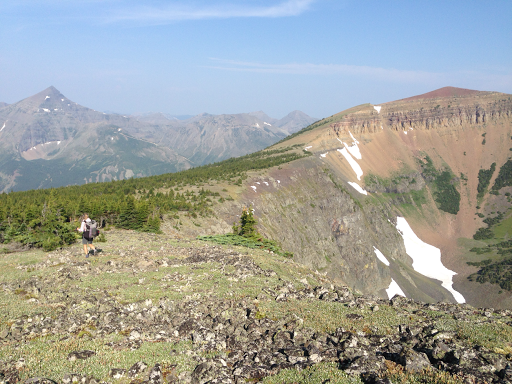 Here’s the view of the ridge walk there (brownish topped mountain in the far distance) from the top of 2471. 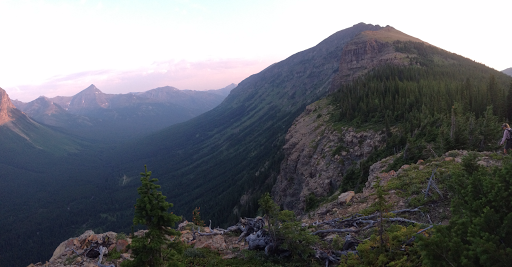 …and the view from the top of South Fork Mountain looking back to 2471. That speck below is E on her way up. We had a bit of sketchy angled scree to work with on the downhill and then were home free down to the South Fork Lakes for lunch before we connected back to the GDT route. It had been breezy up top, but was significantly warmer down by the lakes. We took a nice long lunch break. E even got in the lake. It was too cold for me to get all the way in. We purposely made most of this hike’s itinerary less ambitious so we would have time to take all this in and not feel rushed. So far, we are loving this plan and it’s making for a relaxed pace. As we were finishing lunch, ominous dark clouds moved in and thunder rumbled. We packed up quick an did our descent into the woods. Loved these woods! 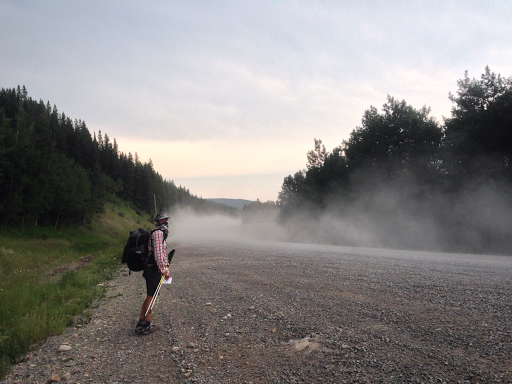 Then we reconnected to the GDT route and finished up the last bit of the road walk…when cars drove by, a cloud of dust kicked up. Man, we were happy to only have to do a short bit of that walk. For those planning a GDT hike and wondering which route to take, it really is a matter of weather and personal preference. 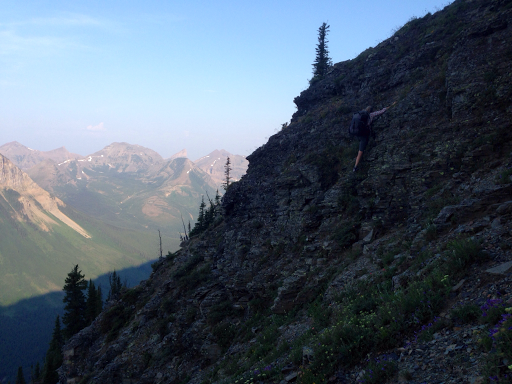 Our alternate on Barnaby Ridge was much more demanding, but paid off in views. It took us 10hrs of hiking time to do that alternate over two days. If you take the original route, you’d get to stop at the Castle Mtn ski resort and stay at the hostel or resupply if needed. If weather is clear and you are a physical person, go for the alt. Not at all recommended in less than ideal conditions up there! From here we had some classic bushwhacking for about 300m/1000ft of straight up hiking in the head and humidity with thunder rolling. It was seriously overgrown, but could have been worse as the brush was easy to push through and didn’t scratch much. We were dripping sweat! From there, it was some relaxing dirt road walking that we greatly welcomed after our more physical day. The description in the guidebook can be wordy and difficult to discern with all the intersecting roads, but we found the GPS track loaded from the GDTA site to be very helpful. With all the variety and challenges today and yesterday, we feel really good and like we are hitting our groove and getting the hang of this trail. There are a lot of resources to look at and that can be confusing. We are finding a more natural rhyme and rhythm to it all and also with each other’s routines and patterns. It’s all coming together quite nicely and we are very happy with how smooth this transition has been. Yay! The clouds continued to gather and thunder rumbled many times a minute. It was very dense forest, so we took the first sheltered thing we could find ( before 7pm) that was level and looked like it wouldn’t be bad in a storm. 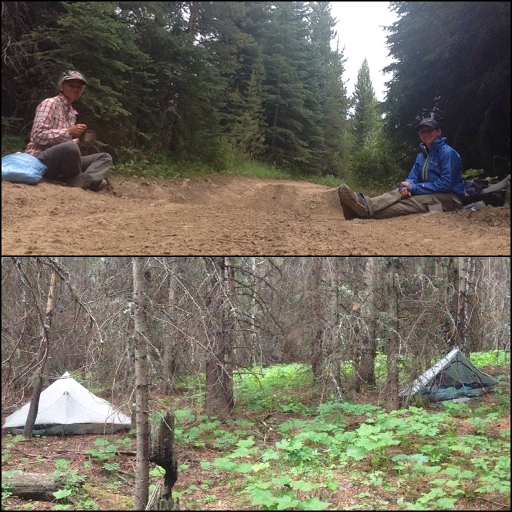 We ate dinner on the road away from camp to keep bears off our scent and it started to rain not long after we got in the tents. It is raining right now and I’m struggling to keep my eyes open. It was super humid and now it’s cooled significantly…hoping for a good night of sleep. We are both a bit depleated after the squirrel fiasco last night!